From the bestselling master espionage writer, hailed by Vince Flynn as “the best in the business,” comes a riveting novel about the French Resistance in Nazi-occupied Paris. 1941. The City of Light is dark and silent at night. But in Paris and in the farmhouses, barns, and churches of the French countryside, small groups of ordinary men and women are determined to take down the occupying forces of Adolf Hitler. Mathieu, a leader of the French Resistance, leads one such cell, helping downed British airmen escape back to England. Alan Furst’s suspenseful, fast-paced thriller captures this dangerous time as no one ever has before. He brings Paris and occupied France to life, along with courageous citizens who outmaneuver collaborators, informers, blackmailers, and spies, risking everything to fulfill perilous clandestine missions. Aiding Mathieu as part of his covert network are Lisette, a seventeen-year-old student and courier; Max de Lyon, an arms dealer turned nightclub owner; Chantal, a woman of class and confidence; Daniel, a Jewish teacher fueled by revenge; Joëlle, who falls in love with Mathieu; and Annemarie, a willful aristocrat with deep roots in France, and a desire to act. As the German military police heighten surveillance, Mathieu and his team face a new threat, dispatched by the Reich to destroy them all. 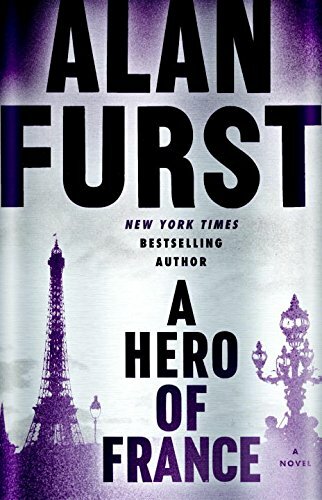 Shot through with the author’s trademark fine writing, breathtaking suspense, and intense scenes of seduction and passion, Alan Furst’s A Hero of France is at once one of the finest novels written about the French Resistance and the most gripping novel yet by the living master of the spy thriller.